Peter Bargh Fine Art Photography - products. Order a Fine Art Print : Canvas printing explained : Acrylic options : How much is Postage & Packing? : How do I view photos from each specific gallery? : How do I order a photograph from the gallery? : Why is only one size available on the order page? : Are my details safe when I order from you? : Is paypal the only payment method? : Can I buy as a gift? When you select a photograph from my collection you can choose to have it printed in one of three variations: Photo Canvas, Acrylic Print or Fine Art Print. 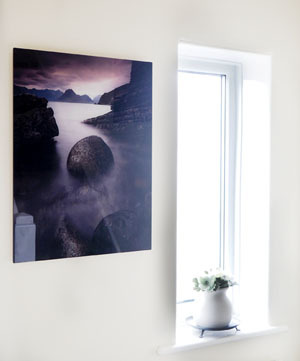 Your chosen photograph is printed onto white semi-gloss artists canvas using special HP Latex ink that delivers high colour intensity and 75 years light fastness. 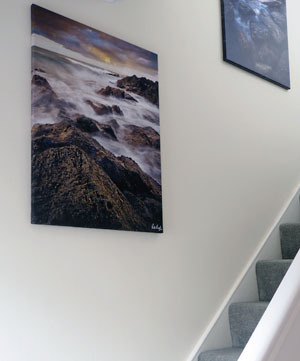 The canvas is then stretched over a 2cm wood frame (thicker frame available if preferred - contact us for details). Your selected photograph is printed on polished 3 mm thick acrylic glass using state-of-the-art UV direct printing and curing technology, resulting in a picture with maximum sharpness, finest colour reproduction and an astonishing sense of depth. The rear side includes a special vinyl film to create the opaque and homogenous white background. How much is Postage & Packing? How do I view photos from each specific gallery? How do I order a photograph from the gallery? Why is only one size available on the order page? 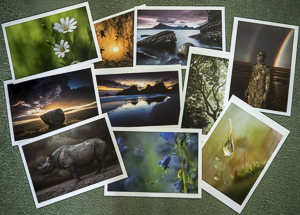 Each photograph has been paired with a recommended mount, all the sizes listed above are available by request. Many photos also suit the square format, as displayed on the gallery pages. Please request when ordering if you prefer square. Are my details safe when I order from you? Yes as soon as you click to buy you are redirected to paypal, a secure online payment company. I also accept cheque, cash, postal order or bank transfer, but these need to be arrange via the contact form. Yes select the address you want it sending to on the paypal order page.